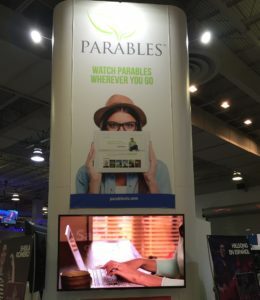 Parables, the 24/7 network that delivers thought-provoking and inspiring movies, TV series and documentaries, as well as a variety of ministries, is present at the NRB International Christian Media Convention – Proclaim 17. Throughout the convention, Parables met with some of the most recognized names in the Christian community including celebrities, ministers and bestselling authors. These sit-down conversations, hosted by TV personality and singer Tony LeBron, focused on promoting the latest projects of each guest and sharing with the audience some heartwarming and motivational stories. During the last day of the convention, Parables had the opportunity to sit down with George Barna – Founder of the Barna Group, who discussed a recent nationwide survey completed by the Barna Research Group that determined that only four percent of Americans had a biblical worldview. Barna, who has researched the Christian Church since 1984, stressed that a biblical worldview is based on the infallible Word of God. Parables also spoke to Nancy Hanson from the Capstone Foundation and the Uplift Foundation, as well as author and George W. Bush impersonator John Morgan – War on Fear and children’s book author Todd Courtney – Be Responsible Like Max. In addition, Don Larson, President of Sunshine Nut Company, shared his story with the cameras. Mr. Larson, who enjoyed a successful career as an executive at a popular chocolate company in the U.S., sold everything and moved to Mozambique, where he created the Sunshine Nut Company and now employs thousands of people. His work and philanthropy is helping communities all over Africa in the fight against hunger, poverty and diseases. For the second day in row, Christian singer Tony LeBron met with well-known Christian personalities, ministers and authors to discuss their latest projects and proclaim the word of Christ. Among those interviewed during the convention are renowned journalist Lauren Green from Fox News, Arthur Rasco from Facing Darkness, Tim Mahoney from Patterns of Evidence, Nina May from Daily Bread and Australian singer and actor Joel Smallbone, who took the opportunity to promote his latest movie Priceless. Up-and-coming singer Christian Cuevas also stopped by the booth, where he shared his experience at the hit reality television singing competition – The Voice. During the sit-down conversation, Christian Cuevas talked about his faith and sang for the Parables cameras. The artist also highlighted that he is currently working on new music for an upcoming EP. In addition, celebrated Christian singer-songwriter, Erskin Anavitarte, also talked about his recent success and the inspiration behind some of his most popular songs. Parables will continue to conduct interviews throughout the day. This year the NRB International Christian Media Convention is being held at the Orlando World Center Marriott in Orlando, Florida, from February 27 to March 2, 2017. During the convention, Parables is conducting uplifting and motivational interviews to well-known Christian personalities, ministers and authors. These sit-down conversations, hosted by Christian singer Tony LeBron, are focused on the latest projects and future plans of each guest. Amongthose interviewed at the Parables booth are Jackie Carpenter and Cameron Arnett from the Christian View, radio personality Autumn Miles, producer Paul Blavin and the Christian vocal trio Selah – who talked about the inspiration behind their music and the great joy caused by proclaiming the word of God through their songs. Emmy Awards nominee Corbin Bernsen and former athlete turned actor TC Stalling, also stopped by the booth to share insight into how they are able to spread the word of Christ through film. Parables also spoke to several renowned authors including Tory Martin – Of Moose and Men, Riva Tims – When it All Comes Together, Robin Bertram – No Regrets, and New York Times bestselling author, TV personality and former Major League Baseball star Daryll Strawberry and his wife Tracy who promoted their latest book Imperfect Marriage, Help for Those Who Think It’s Over. In addition, Nathan Blair from Behind the Scenes: A High School Story, a documentary-style reality show that provides viewers with an unprecedented look behind the challenges of indie filmmaking, and Whitney Lynn from Ignite Your Light Kidz, a fun and educational TV show for children, announced that these series will premiere on Upliftv in the near future. Parables will continue to conduct interviews throughout the remainder of the convention. This year the event is being held at the Orlando World Center Marriott inOrlando, Florida, from February 27 to March 2, 2017. Parables is owned and operated by Olympusat, Inc., one of the largest independent media companies specializing in the ownership, distribution, production and technical services of Spanish-and English-language channels, and it’s currently available on Hotwire. Kingdom Sight Studios and Parables prepare to launch Behind the Scenes: A High School Story, a documentary style reality show that provides viewers with an unprecedented look behind the challenges of indie filmmaking and the passion that drives them on. The Story follows Nathan and Mike Flack the VP of Kingdom Sight and chronicles their efforts as they work through all the facets of making a film, from script to casting, to production, to the final product. They are a David to the Goliath of Hollywood. Faced with several insurmountable odds, the pair takes viewers on an intimate and emotional walk through the drama of slaying the giants of an accelerated timeline, the struggles of trying to secure funding, finding the right cast and 6 weeks of production in a state where the weather can change in an instant. Victory comes with keeping faith alive. “They’re not from Hollywood. They don’t have named actors or a recognizable face. They don’t have a big budget, or any budget for that matter. They don’t do things like others do, and that’s exactly how they like it,” stated Isaac Hernandez, VP of Programming for Parables. This is a Parables original that will premiere on Upliftv this spring. Parables, the 24/7 network that delivers thought-provoking and inspiring faith-based entertainment, announced a content distribution agreement with Truli.com, a family-friendly website featuring thousands of On-demand videos and streaming content in English and Spanish. As a result of this agreement, Truli.com audience now has access to Parables’ robust collection of uplifting Christian movies and series, captivating documentaries, educational children’s programming and acclaimed original productions. “We are very excited that Parables is now available on Truli.com, allowing its viewers to now watch On Demand movies from Parables and to subscribe to Parables’ monthly subscription service,” said Bob Higley, CEO Parables and Upliftv. “A partnership between Parables and Truli makes sense. Both Truli and Parables provide families with an alternative to traditional network television. Our partnership creates the perfect combination of faith and family friendly programming options and a large selection of full length feature films,” stated Michael Jay Solomon, Founder and Chairman of Truli Media Corporation. “Parables is synonymous with high-quality family entertainment, as is Truli. We consider the partnership with Parables to be an important milestone for Truli,” added Paul Crouch Jr., Vice President of Truli. Truli.com is an internet destination offering inspirational family entertainment and featuring a media library with thousands of on-demand videos and streaming content in English and Spanish. Truli.com subscribers now have access to dozens of Parables’ faith-based movies, including: 2 to Tangle, Another Perfect Stranger, Clancy, Cowboys of Faith, In the Mirror, Figure in the Forrest, Nathalie’s Rose, Nikki and the Perfect Stranger, The Perfect Gift, The Perfect Stranger, The Heart of Texas, Two Brothers, among others. Since its inception in 2009, Parables has proven the remarkable interest and appetite for quality Christian-themed entertainment content. As time has passed, the network’s audience has steadily increased worldwide, enticed by thought-provoking stories of faith that share God’s life-transforming truth –a message of hope, compassion and love. Families no longer have to wait for Christmas to come around every year for uplifting programming. Today, the faithful can watch an unrivaled library of the most recent Christian movies and exclusive faith-based content whenever and wherever they want, using the latest digital streaming technology. Parables offers a Subscription Video On Demand service though its website and mobile devices. Viewers can also watch On Demand or the Live Stream with their Parables subscription on televisions with Apple TV or Roku. Parables’ programming consists of mostly Christian movies, documentaries, reality shows, comedy shows, music specials, children’s programming and original productions. These programs are values-driven, inspiring and encourage conversation about topics that are culturally relevant to practicing Christians. Parables was developed to provide families with an alternative to traditional network television. What sets it apart from any other Christian network that may showcase preachers and teachers is its absolute focus on providing faith-based entertainment. Visit parables.tv for more info. Parables, Olympusat’s 24/7 network that delivers thought-provoking and inspiring content, will be presenting their brands and products to the Hispanic community at EXPOLIT 2016 in Miami, Florida, at booth #836. Since its inception in 2009, Parables is committed to deliver high-quality Christian-themed entertainment. As time has passed, the network’s audience has steadily increased, enticed by thought-provoking movies, documentaries, series, children’s programming and original productions. This year, Parables is looking to share the word of God with a wider audience, especially the Hispanic community. EXPOLIT, is the largest Christian booksellers, media, and music convention in the U.S. and Latin America. Every year the convention holds numerous workshops, seminars, concerts, and movies. This year the convention is taking place from September 15 to September 18, 2016 at the Miami Airport Convention Center (MACC), in Miami, Florida.